Those with a keen interest in wine should be excited about the current releases of some of the Gippsland 2012 Pinot Noirs. After the shocking climatic conditions of high rainfall and humidity in 2011, there are some stunning 2012 wines available. Just last month we were particularly delighted to see our friends (and Gippsland Food Adventure hosts) Neil and Judy Travers win the "Wine of the Year" award at the recent Gippsland Wine Show with their Waratah Hills 2012 Pinot Noir. Now Gippsland is finally getting on the radar as a fine wine producing area. It is a broad and diverse region, one of Australia’s biggest, and is forging a reputation for its Burgundian varieties of Pinot Noir and Chardonnay (but Purple Hen on Phillip Island also makes a lovely shiraz). It’s dominated by lots of independent small producers, the highest profile one being Phillip Jones at Bass Phillip winery. Over the years I’ve been fortunate to enjoy his hospitality at the winery and taste some of his wines and they are very special. 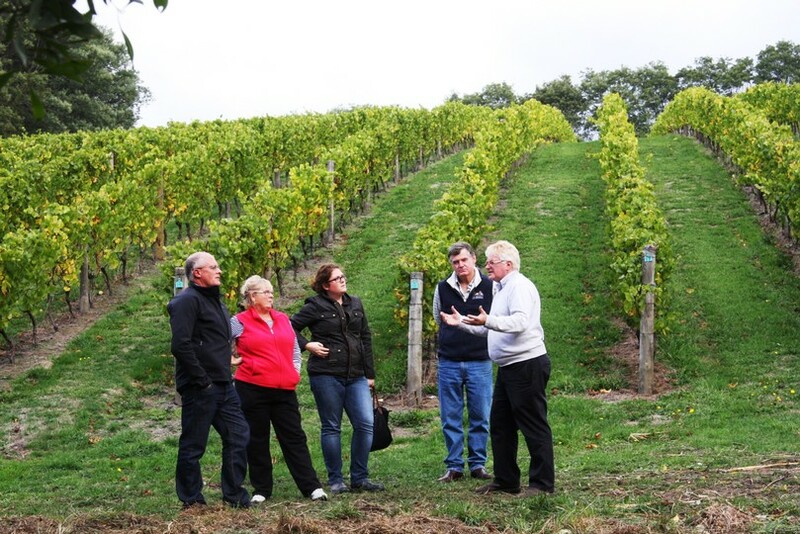 He developed his vineyard at Leongatha South in 1979 after carefully selecting the site based on all the factors such as climate, soil, slope, etc. that go to develop the undefinable "terroir". His wines are ranked at the very top, with Langton’s Australian Classification ranking his Premium Pinot Noir alongside Penfold’s Grange – so he’s in good company! As might be expected these bottles aren’t cheap, but there are alternatives - Phillip’s influence extends beyond his own vineyard to those he planted in the early days for other growers. Waratah Hills at Fish Creek is one such vineyard planted under Phillip’s guidance – high density planting and low yielding. Neil and Judy bought the estate 5 years ago and are responsible for the producing the grapes, and Marcus Satchell, a young winemaker of considerable talent (and musical ability), is crafting that fruit into beautiful wines. Marcus is a "local boy", who has returned to Gippsland to make wine after studying and working overseas and in the Yarra Valley. He talks about wine in a knowledgeable and fun way, backed by much experience as a wine show judge and Len Evans Tutorial graduate. As part of a recent Gippsland Food Adventures’ event, Marcus ran a Pinot masterclass - tasting and discussing five 2012 South Gippsland Pinots. Despite a common year, region and grape variety, the wines were very different, largely reflecting the terroir of the individual vineyards – different wines appealing to individual’s taste. And pricing for these wines is around $35-40. Might sound a lot, but I just haven’t been able to find Pinot of decent quality for less than this, and as consumers we have to be prepared to sufficiently reward the smaller producers for their efforts so they can continue to produce such gems. So what should we eat with this nectar of the Gods? Try salmon, wrapped in prosciutto, baked on a bed of asparagus! It’s a simple and tasty dish from Delicious magazine I pull out this time of year when asparagus comes into production from the local Koo Wee Rup flats. Roast the asparagus tossed with olive oil for 5 minutes then cook the salmon wrapped in prosciutto (drizzled with olive oil) on top for 8-10 minutes, and there you have it. Serve with a dressing of ½ lime juice, 2 tbs mayonnaise and 1/3 cup sour cream, with grated zest of lime sprinkled on top, and a green salad.